The theme of 2013 and, apparently, 2014 is better late than never, so, a week after the switch to the new year, I’m finally getting around to cooking a celebratory meal. Call it the Fifth Day of New Year, if you will. 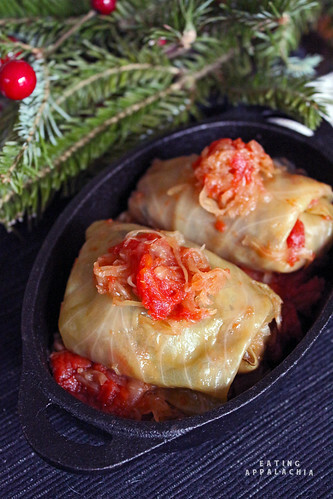 These stuffed cabbage are actually part of G’s Christmas tradition–one part of the Slovak twelve course Christmas Eve meal. So maybe, actually, these cabbage are the Eleventh Day of Christmas cabbage? Either way, they work for a cold, snowy/freezing rain weekend afternoon! Stuffed with a mixture of rice, mushrooms, TVP, carrots, onion, and herbs and topped with sauerkraut and tomatoes, the cabbage rolls aren’t quite the same as those of G’s childhood, but I think they give an updated nod to tradition. Plus, instead of using a pressure cooker like his mother did all those years ago, I put into play our handy dandy new slow cooker for an oven-free, hands-off stuffed cabbage experience. Served with a side of smoky split pea soup and enjoyed in front of a roaring (gas) fire, there’s little not to love about these little cabbage rolls! Remove the outermost leaves of the cabbage and rinse to clean. Fill a stockpot 3/4 full of water and bring to a boil. Once boiling, lower the full head of cabbage into the water and boil a few minutes. Remove the cabbage and slowly peel of the softened leaves, placing back in the boiling water to soften layers as necessary. Once you have 12-15 leaves, turn off the heat to the water and set the cabbage and leaves aside. In a small mixing bowl, combine the TVP with the boiling water. Set aside to fully absorb. In a large saute pan over medium heat, warm the olive oil and add the onion. Cook until soft, 5-7 minutes. Add the carrots, celery, mushrooms, smashed garlic, rice, and TVP and cook another 3-4 minutes, until the mushrooms begin to soften and release their juices. Add the spices and soy sauce, cook another minute, then remove from heat. Take each leaf and thin the bottom part of the rib with a paring knife. Fill with 1-2 tablespoons of filling (depending on leaf size you may add more) and roll into packets. There’s a great photo tutorial here for more instructions. Rinse the sauerkraut in a mesh colander. Squeeze out the extra liquid and layer half on the bottom of your crock pot. Place the cabbage rolls in a single layer on top of the sauerkraut until they’re all in the crock pot. If your crockpot is round, you may have to repeat several layers of sauerkraut in between cabbage roll layers (mine is oblong and wide and could fit them all in one layer). Top with the remaining sauerkraut and pour the diced tomatoes on top. Add the vegetable broth and cover, cooking on high for 3 hours or on low for 6.
this is just speaking my name! i love stuffed cabbage so much and haven’t had it in so long. it’s such a perfect comfort meal now that the holidays are over and it’s cold, snowy, and depressing. You really know these are authentic, with all that sauerkraut! I haven’t had stuffed cabbage in a really long time, so this may be going on the list. Yum! I made stuffed cabbage recently but yours looks much prettier than mine did. I’ll have to return here and try your version (minus those mushrooms!) next time. Have you ever frozen you cabbage to make it easier to pull the leaves off (as opposed to boiling it)? I tried it this time and it worked, although you have to plan in advance as you need to freeze it thoroughly then thaw it thoroughly. Better late than never! Besides, you definitely made up for the tardiness with the yummy stuffed cabbage. I don’t believe I’ve ever had stuffed cabbage but it looks delicious and I love the presentation. I hope 2014 is treating you well! First of all, love your blog! Second, I used to live in Romania, where this dish is called sarmale! I am making this recipe today! I have no idea what I’m doing, and no previously consumed cabbage rolls to compare them to, but the filling part tasted delicious so here we go. I’ll post a picture or two to Instagram, and you already follow me there. Thank you for sharing a family heirloom.